Ed Cheesman lives with cerebral palsy; he has no ability to speak and has no muscular control. But once the 21-year-old is immersed in water using a specially designed treatment, the impact is profound. “I feel so calm in the water,” he wrote in a letter he composed with the help of his father. Mr Cheesman blinks at an alphabet board when his father points to an individual letter. “I feel my own muscles moving me instead of the unwanted ones, and the pain and tightness I feel in my joints and muscles disappear,” he wrote. The treatment is called immersion therapy and it was started up by Determined2 founder Peter Wilson. “The first response is, ‘Oh, you’re scuba diving’. Our quick response to that is ‘no, we’re not’,” Mr Wilson said. 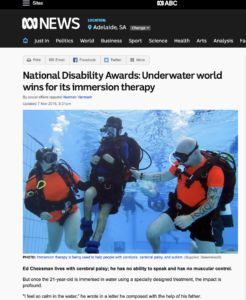 Scuba gear is used, but immersion therapy is about more than just diving in a pool. It is accessed through medical referrals and has been used to improve the lives of those who live with paralysis, cerebral palsy, and autism. “Things like pain reduction, general wellbeing, mental health, and across the board everything’s just getting outstanding results,” Mr Wilson said. 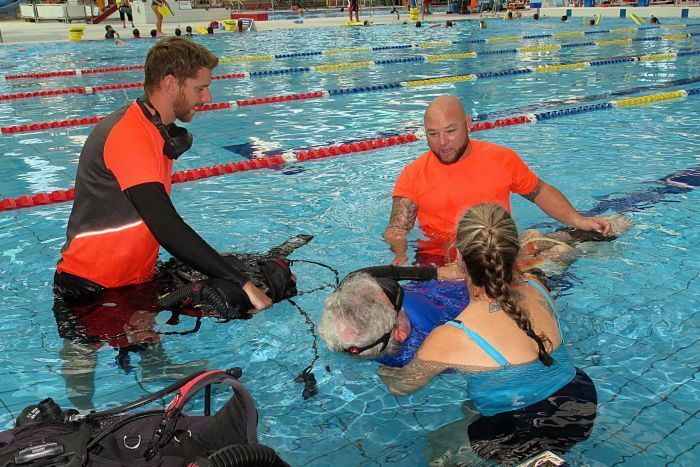 The Adelaide-based facility is helping people with a disability go underwater to discover a freedom of movement that would otherwise be impossible. Determined2 was one of the winners on Monday night at the 10th National Disability Awards at Parliament House in Canberra. The awards have one key criteria: finalists must do something to improve the lives of Australians with a disability, their families and carers.